I don’t know how it has been where you live, but in our area I have never seen as many stink bugs as there have been this year. They get in the house, in the car and fly out of trees onto your clothes. They seem to be everywhere, like a plague of locusts that Moses called upon to blanket Egypt. Well, maybe they are not that numerous, but they sure are pesky little fellows. And don’t squash one or you will discover why they are called stink bugs! I always keep drinking water in my car so I can sip a few swallows from time to time as I am traveling about from one location to another. The other day while I was waiting at a stoplight I thought it was a good time to gulp down a little water. As I reached for my water I noticed there was in my cup a stink bug performing a good imitation of Michael Phelps doing the breaststroke. I decided to let him have the water and I would wait until I got home to have a glass of H2o. While we should be most thankful for those days we experience when the events of the day linger in the air like fine smelling perfume, we have to admit most days contain a “stink bug” or two. Now we have a choice when they appear in our lives. We can focus on the fly in the ointment and let it stink-up and affect our attitude and actions in everything we do and say, or we can focus on His presence and the many wonderful blessings the Good Lord has bestowed upon us. We need to remember that no matter what “stink bugs” get in our perfume our focus must ever remain on Christ who loves us “and has given himself for us an offering and a sacrifice for a sweet smelling fragrance” (Eph. 5:2). Christ is our breath of fresh air and our sweet smelling fragrance in a fallen world that has its share of “stink bugs” that fly into our lives. By daily “looking unto Jesus the Author and Finisher of our faith” (Heb. 12:2), when the unexpected happens, the fragrance of His presence surrounds us and the aroma of His life overpowers the putrefying stench of any “stink bug” that seeks to overtake us. There is no sweeter fragrance than the eternal fragrance of grace found in Jesus Christ. Typified as the Lover in the Song of Solomon, Christ is daily “dropping sweet smelling myrrh” (S of Sol. 5:13) amidst the invading stench of a fallen world. He is the sweet smelling Rose of Sharon and the fragrance of His presence is eternally fresh. As Esther bathed herself in the sweet smelling fragrances of the Persians perfume, each day we must bath ourselves with the sweet fragrance of His presence so will not be overtaken when unexpected flies or stinkbugs seek to intrude into our lives – and they will. As we daily, like Moses, communion with the Lord face to face as a man speaks unto his friend (Ex. 33:11), renew our mind with His Word, yield ourselves to His purifying Spirit and seek to walk in His chosen path for, the fragrance of His life will encompass us. While I cannot put a lid on the cup of life to keep out unwelcome circumstances and situations, I can drink from the cup of salvation wherein His sweet presence dwells (Ps. 116:17). 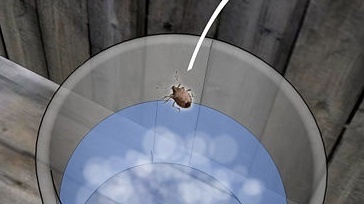 Now excuse me, I have to go put a lid on my cup of water in the car to prevent stink bugs from using it to practice their swimming. The funny thing about stink bugs in life is that we so often focus on them to the neglect of everything else good that might be happening around us. Thanks for the post! WAS THE ANGEL GABRIEL RIGHT?